To get to school Erick Loyo’s parents had a daily commute of up to three hours. Growing up in a poor part of Mexico life was tough, but the lessons they’ve learned and the work they’ve put in have certainly rubbed off on their son. Erick takes nothing for granted and has had instilled within him a mentality that never disregards opportunity, least of all when it comes to education. After graduating from Montclair State University Erick worked his way up in investment banking. But he hit a crossroads and admits feeling uncomfortable when liaising with senior leaders—he didn’t feel he had the credibility he wanted with top-level management. “Once I was able to pinpoint that a lot of these managers had already been to business school, that gave me the drive to go on and do an MBA,” he recalls. 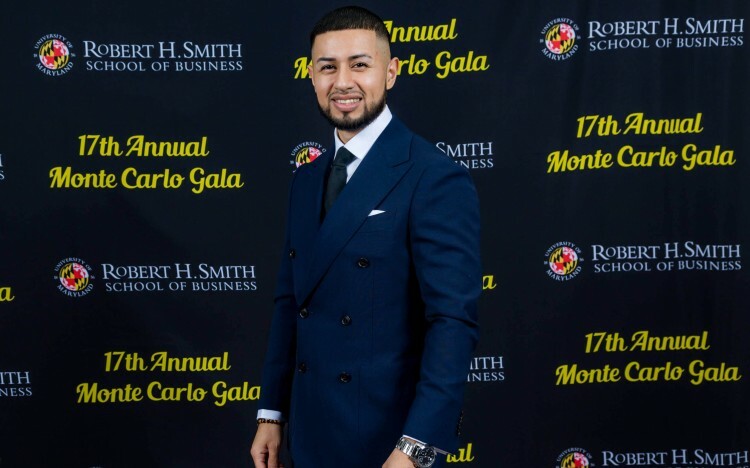 Erick is now a Full-time MBA student at the University of Maryland’s Robert H. Smith School of Business. He says that though the Smith MBA wasn’t on his radar at the start of his MBA journey, meeting the admissions team completely changed his mind. So, how did Erick ensure he stood out during the MBA application process? “Everybody who applies to business school needs to be very introspective as to why they want to do an MBA, and why they want to go to that program,” he says. To excel during the Smith School MBA application process Erick says you have to be a genuine person. The admissions team want people who will be involved in social impact inside and outside of the classroom, someone who will look out for their peers. “They want the person to be a person, and not a robot,” Erick explains. Maria Pineda (pictured), senior director of MBA admissions at the University of Maryland’s Robert H. Smith School of Business goes further, explaining that she is after MBA students who understand that this is their ticket to transformation. There’s a misconception, she asserts, that students think they arrive on an MBA program and then have time to figure out what they want while they’re there. She wants students who to come in with an idea of where their ambitions lie. The most common mistake that Maria sees in MBA applications is a lack of cohesiveness. She cites examples of students who say they’re interested in marketing in their essay, but then their recommendation talks about their interest and success in finance, and how they’re going to excel in that going forward. Take a step back, she advises, and look at every part of the application to ensure you’re communicating the same message throughout. That’s not to say that you need to be a polished, erudite scholar. In fact, that’s part of the lure of an MBA program in itself; it’s a ticket to transformation, as Maria points out. On the Smith School MBA, if you’re a rough diamond Maria says you’re in the right place—“your knowledge will be elevated,” she guarantees.